Faeries are tiny magical creatures that live in Neopia. Meeting one is said to be very lucky indeed, as they can bless your pets with all sorts of powers and abilities. A pet must be strong enough to control the faeries spells though, so if your pet is inexperienced then the faerie may just fly away. There are many different types of faeries with differring powers, abilities and temperaments. Click here for a partial list of abilities! The Air Faeries are magical, joyous little creatures who love to dance on the wind. Meet one and it will bless your pet with abilities from the sphere of air - powers such as invisibility, haste or flight. The Earth Faeries live in the forests of Neopia, making their homes between the branches of the tallest trees. They love to collect and store items, and try and hide themselves from the creatures far, far below. They can grant powers such as toughened skin, the ability to magically create food or burrow into the ground. Fire Faeries are mischievous urchins that inhabit the hotter realms of Neopia. They love nothing better than playing tricks and causing havoc wherever they go. If you want a strong creature in combat then visit these Faeries, as they can grant many battle magics. Swimming in the rivers and streams, unseen by most, are the Water Faeries. They can be heard singing quietly at night, but only if they aren't aware that you are near. They specialise in healing and defensive powers that will protect your pet from harm. Living on clouds on the upper levels of Neopia are the radiant Light Faeries. Devoted to the cause of good, they will rarely stray deep down to the lower levels. If a creature is noble and bold of heart, these magical sprites can grant him or her holy powers such as bless and restore. And lastly, the Dark Faeries, minions of the evil one himself. Lying in wait to tempt those weak of heart, the power granted by these evil imps is great, but at a price. These evil Faerie abilities include creating darkness, draining life and vision at night. The Soup Faerie is a kind and gentle soul. 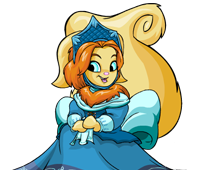 Unlike the other Faeries, she cares very little for her own appearance, preferring to spend her time helping the starving pets of Neopia. Any pet she comes across who is malnourished will be given free food and a warm bed until they are ready to brave the world. The Faerie Queen spends most of her time in her enormous castle in Faerieland. From here she rules over all the other faeries and keeps the Hidden Tower stocked with incredible rare items. Living amongst the stars, the Space Faerie rarely visits Neopia. She will only do so in case of an utmost emergency! In olden times of war this magical creature was said to help inexperienced pets learn to defend themselves and on rare occasions teach the strongest ones a lesson they would never forget. Living amidst the harsh climate of Terror Mountain, Taelia is always in need of spell ingredients. If you pay her a visit she will reward you most kindly for your aid. Jhuidah watches over the Island Cooking Pot. Sometimes she adds a dash of magic to your recipes to help you create something extremely rare and unusual. A poor miserable creature that has lost her magical powers and can't even fly. So far we have only heard of one although there may be many more hiding around Neopia.